May | 2011 | okay, peanut. Just some mom stuff that I want to hold on to … I understand if you don’t make it through until the end! 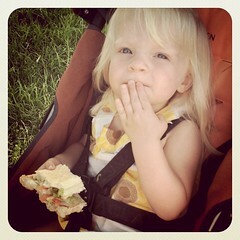 Really, I had no idea parenting could be so incredibly rewarding! Up until around 5 months was a serious adjustment period for me. After that, as each month passed, I swore it would be the best. Almost 2 years later, that trend has continued and I’m still saying the same! The best just keeps on coming. I’ll share a picture of Kitty soon. I hadn’t realized just how much personality he had until today, but he’s as much a part of our family as we are! He’ll jump on your head and refuse to get down. He’ll tuck himself under the covers and go ‘ni-nite.’ He even eats off your dinner plate! My favorite is when he licks my face. Okay, you may have guessed it – Kitty is Lil’s most favorite stuffed friend! Did I trick you?! I got a good laugh twice tonight over donuts. 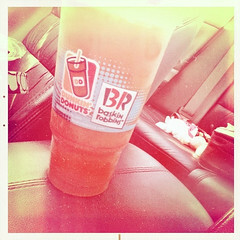 I think I’ve mentioned it here before – I am 100% obsessed with Dunkin’ Donuts iced coffee. I’m not even going to try to hide it anymore – it’s true. Well, I go there so often that Lil now knows the location. I picked her up this evening and had to pick up the dry cleaning on our way home. At the traffic circle by the Dunkin’ Donuts, she started laughing, put her hand up to her mouth, and giggled, ‘Donuts?’ OMG. So we went home and headed out again. Truthfully, we were headed to Dunkin’ Donuts to pick up coffee beans (And no, I did not get an iced coffee! Talk about willpower!). About a mile from the house (and maybe 3 miles from Dunkin’ Donuts), she asks as we make the first of 5 turns to the store, ‘Donuts?’ I’ve created a monster. She hates wearing her bike helmet. We went to the park tonight and took her bike for the first time. I don’t think she actually needs a helmet as it’s a tricycle, but I want to start the habit now so we don’t have to fight her later. I’m beginning to question that decision, though I know it will take a lot for me to change my mind. The Mr. even stood behind me on this one, taking her off the bike when she removed her helmet. We’ll see how things progress – I wonder if she’ll get used to it? Buses are the coolest thing. She knows where they are on our way to and from places, and she points every one of them out. If it’s not there, she asks, ‘Where bus? Where go?’ And when they are there, she shouts, ‘Bus!’ and then proceeds to tell the bus ‘Bye bye, bus!’ as we drive away. I love it. She also likes to point out trucks (large pickups and tractor trailers), tractors (Yep, they’re often road vehicles around here. ), and the ‘choo-choo.’ Same rules apply to the train – almost every morning, I hear her say as we pass over the railroad tracks, ‘Where choo-choo? Where go?’ Melt my heart. I guess that’s about it. If you’ve lasted this long, two thumbs up. And if you didn’t, well, you wouldn’t be reading this anyway, but I’d tell you that it’s okay – it’s my mom (Er, she calls me ‘mama.’) moment, so I don’t expect you to be interested. No worries! 365 project (145) … gas & guinness? 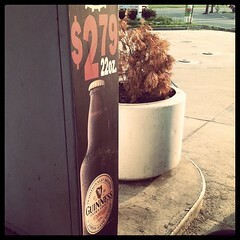 Can’t say I’ve ever seen Guinness advertised at a gas station … guess there’s a first for everything! iphone app – to do list. I’m terribly picky about certain things. My latest search involves finding the perfect to-do list app for my iPhone. I need something that is in a to-do list format with reminders (multiple), manual sorting and color coding. I get so sentimental when this day comes around each year. Granted, this is only the second (Or third, depending on how you look at it.) time we’ve been here, but both times have been full of such joy that I really feel my heart could explode at any second. I fight back the tears of joy throughout the day – tears that come from memories of that day. I think about that day two years ago and try to remember what I was doing at that very moment. I have a rough timeline in my mind, and I know for SURE what I was doing at 2:00pm on Monday, May 11, 2009. Holding our beautiful, brand new baby girl. Happy birthday, Lily Rose. I’ll never be able to express, through words or actions, just how much you mean to me. Sometimes looking at you takes my breath away. You’re beautiful, with an amazing spirit. Your joy and laughter make me smile, and the sound of your voice reminds me of just how much you mean to me. May you have a life full of happy days. When bad things come your way, I hope you have the confidence in yourself to tackle them head on, letting the things that don’t really matter roll right off your shoulders. And I hope the strong connection you have with your dada lasts a lifetime. You’re truly a daddy’s girl if I’ve ever seen one. Does it make me sad sometimes that you don’t want to sit with me and fall asleep? Sure, but I know dada loves you as much as I do, so I manage. I know you love me, so I don’t worry. I love you, sweetheart, and I’ll always be here for you. Thank you for showing me what love truly is – it’s because of you that I’m more patient, more kind, and more understanding. You make my days sunny and my spirit bright. Happy birthday to you, my sweet Lily Rose! 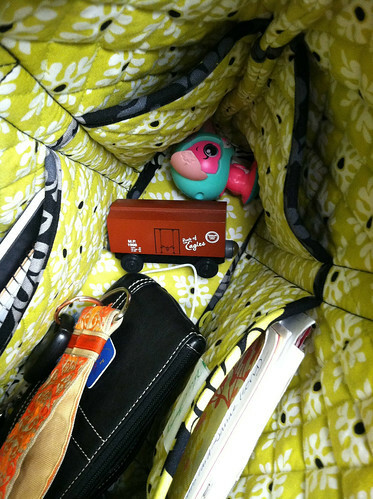 I had another mom moment this morning when I reached into my purse to grab my keys … and found other surprises left by Lily! These are the moments that make me smile – being a parent is so amazing! So the weather has improved slightly for Saturday, and the map looks a wee-bit better. We’re now looking at a 30% chance of rain instead of the 60% from yesterday’s forecast! Hey Mother Nature, let’s keep it going in the right direction, please!!! Sometimes life’s little reminders come at a time when you need them most. … I looked at the weather forecast. I’ve been watching it for the past week, and up until yesterday, there was a 40% chance of rain on Saturday. My aunt was telling me to stay positive, and I was following her advice. No, there’s no escaping this storm. Waaah! Yep, I’m a little bit upset. I know it is what it is, but honestly, I’m so totally disappointed. Months of planning this outdoor event, only for us to be forced indoors. Ugh. So back to this reminder. 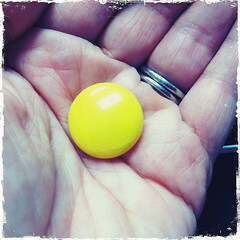 Just minutes ago, I opened my drawer at work to grab a fruit strip and something yellow caught my eye – it’s a round, yellow magnet about 1″ in diameter – something someone who resided here before had left behind. It’s cracked in several places, but its flaws don’t bother me. Why not? Everything will be fine. Sure, it’s absolutely going to rain on Saturday, but what can I do about it? Lil’s party won’t be exactly as I planned. So what? The rain is just like one of those cracks in my little yellow magnet. Is there, but it doesn’t really matter. Our friends and family will be with us to celebrate a fabulous little girl, and that’s all we really need. Sure, we’ll be packed in our house like sardines. I’ll get over it, and it might just end up being more fun! 365 project (130) … juish.